In past articles, I have looked at distributions that were built with some scientific discipline in mind. In this article, I take a look at yet another one. In this case, I cover what is provided by NeuroDebian. I probably should start by clarifying that NeuroDebian is not strictly a Linux distribution in the classical sense. The people behind NeuroDebian began by working on PyMVPA, a Python package to do multivariate pattern analysis of neural data. To make this package easy to deploy, NeuroDebian was created. Over time, more and more packages were added to NeuroDebian to try to create the ultimate integrated environment for neuroscience. All of this work is described in a scientific paper, "Open is not enough. 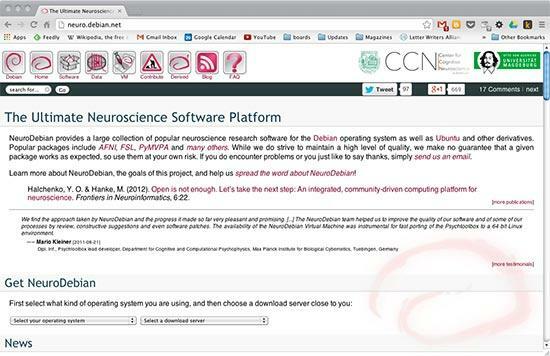 Let's take the next step: an integrated, community-driven computing platform for neuroscience". This paper is available at the "frontiers in NEUROINFORMATICS" Web site. Installing NeuroDebian is a bit different from other distributions. On the main home page, there is a section called Get NeuroDebian. Here you can select which distribution you use as your desktop and the mirror from which you want to download. to download the package definitions for everything provided by NeuroDebian. Figure 2. You can get NeuroDebian further down on the main page. This works well if you already are running some version of Debian, or a derivative like Ubuntu, as your desktop operating system. But, what can you do if you are running Windows or Mac OS X? 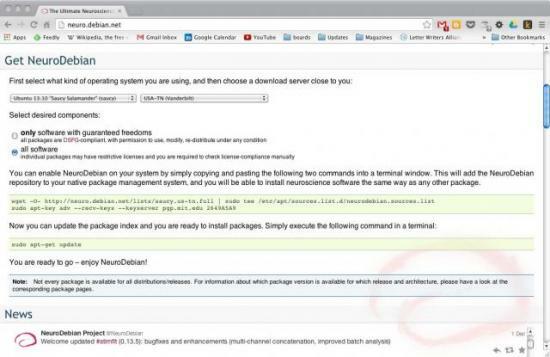 The NeuroDebian project provides a virtual machine option for those situations. If you select either Windows or Mac OS X as the operating system in the download section, you will be provided with a link to download an OVA file. This type of file is a standard file format for virtual machines. For example, you can import this file into Virtual Box (Figure 3). This virtual machine uses Debian 7, or Wheezy, as the core operating system. The main Web site says that GNOME is used as the desktop environment. Figure 3. 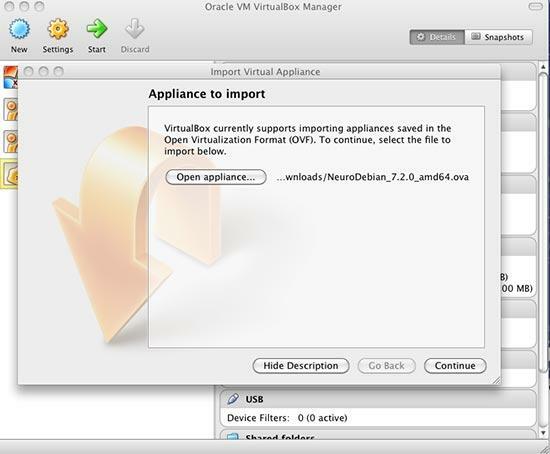 The OVA file can be imported in Virtual Box to get a complete environment. However, when I actually installed the latest version of the virtual machine, the desktop environment that is used is XFCE. You even could use this on your Linux desktop in a virtual machine. This way, you always have a stable, complete computing environment for neuroscience that you know will not change or be broken. When you first start up this virtual machine, you will be presented with some configuration steps. The first step is to do an update of the installed packages. After this, you will be asked whether you want to take part in an application survey. If you are using NeuroDebian regularly, you may want to take part in order to provide feedback to the team. Several tools require environment variables to be set. The next step asks you whether you want these to be set automatically in the default profile settings. The next step allows you to select several extra packages like Emacs, a PyMVPA tutorial and R. Be prepared for a bit of a wait, as there are several packages to be downloaded. In my case, I ended up with a download of 625MB of extra packages. After all of the configuration steps are completed, you can click on the Applications Menu button in the top right-hand corner and go down to the NeuroDebian menu entry. Here you will find all of the particular applications specifically selected for neuroscience. They are broken down into categories for electrophysiology, medical imaging, psychophysics and a section of support links to access the relevant mailing lists. There is also an entry to re-run the setup wizard for the virtual machine. Now that you have NeuroDebian installed and set up, let's take a quick look at some of the provided tools. The core reason for the creation of NeuroDebian was to deploy PyMVPA, so let's start there. PyMVPA provides a set of tools to do multivariate pattern analysis on large data sets. This is very useful in neuroimaging. Several processing steps are usually involved in this type of work flow, such as data preparation, classification, feature selection and generalization testing. PyMVPA provides high-level abstraction of these processes. A tutorial is available at the PyMVPA project Web site that walks you through the core concepts and processes involved in using it. A full description of what you can do would require a whole article on its own. PyMVPA isn't the only software included, however. Going to the package list at the NeuroDebian home page gives a full listing, broken down into the following categories: distributed computing, electrophysiology, magnetic resonance imaging, modeling of neural systems, neuroscience datasets and psychophysics. An interesting piece of software is under the educational category: virtual-mri-nonfree. This package provides a virtual MRI scanner to simulate running an MRI. This way, you can learn about how scanner parameters affect your images—a very cool tool. Software is not the only thing provided by the NeuroDebian distribution. There is also a rather large set of data packages available, all in one location. These include items like brain atlases, fMRI data from face and object processing in the ventral temporal cortex, and an MRI-based brain atlas of the anatomy of a normal human brain. There are tutorials for PyMVPA and MRI analysis that require sample data sets. These also are available from NeuroDebian. Additionally, there is a blog on the NeuroDebian Web site where you can find articles on specific tools and help with particular techniques. If you do work in computational neuroscience, you could do worse than starting with NeuroDebian. This distribution gives you a full set of tools to get you started. There even are further derivatives of NeuroDebian, built to support classwork or to have a specific subset of the tools available for well-defined work flows. Maybe other research communities might be tempted to do a similar project? If you have the ability, you should consider offering some of your skills back to the project in order to help it grow. Of course, this is true of all-open source projects.